Have an opinion on sport? You are a CouchExpert. Premier League Focus: Has Liverpool FC hit its Inflection Point? Chris Gayle’s explosive hitting has been the talking point of this year’s Champions League. After giving his team, RCB, explosive starts but failing to capitalize on it in the first two games, Gayle sought help to improve his longevity at the crease. He found in on the aisle behind P1 stand and between the two BCCI boxes at the Chinnaswamy. Yes, he met the doctor W. G. Grace (@WGGrace2) to fix his problems. Let’s eavesdrop on this conversation that Anil Kumble facilitated for Gayle. Gayle plots Mumbai Indians' downfall with W. G. Grace. CHRIS GAYLE: Maan, I have trouble lasting more than 5 overs maan. W. G. GRACE: I don’t understand. CHRIS GAYLE: You are a doctor and a great cricketer. How come you don’t understand? W. G. GRACE: I mean, I understand what you said. I meant, no one understands what you tweet. CHRIS GAYLE: It’s Jamaican maan. Not many Englishmen understand how and what we talk/tweet. W. G. GRACE: What’s the thing you weild? I hear it weighs 10 lbs? CHRIS GAYLE: My Bat? Weighs about 4 kilos. Why? W. G. GRACE: Start using a 5 kilo bat for the first 6 and then change to a lighter bat. CHRIS GAYLE: I’m not here to win the weightlifting gold. Tell me how I whack sixes and still last 20 overs. W. G. GRACE: Reverse the bat – hold it upside down. That way you maximize hitting the yorkers with the bat handle. With fine-leg and third-man up these days, you are bound to edge more past them for boundaries and sixes. Difficult the conventional way. CHRIS GAYLE: Are you mad? I’m facing Malinga tonight. There haven’t been many like him. He distracts people with his noodles hairdo and bowls round arm in a trajectory such that the ball is lost in his hair that is dyed white. W. G. GRACE: Chris, when I see Malinga, I fancy facing him. I played in an era of the quickest round-armers. You’d be lucky to even last a delivery of the likes of Alfred Mynn and Edward Stevens. CHRIS GAYLE: They were quicker than Malinga? W. G. GRACE: They were so quick that the ball reached you even before they let it go! CHRIS GAYLE: And you managed to survive them? W. G. GRACE: More than just survive! I used to hit them for tons of runs with a stick of rhubarb. All the 100+ meter hits you hit these days, I hit them with just a stick of rhubarb. CHRIS GAYLE: 100+ meters? Have you seen me smash Lee out of The Oval in the T20 world cup in 2009? Did you see me smash one out of Chinnaswamy on Friday night? W. G. GRACE: Of course, I did. I hit one out of The Oval too. It is just that I hit it from Lord’s. It flew out of Lord’s and then eventually to The Oval and out of it too. It was a few kilometers long. CHRIS GAYLE: What? I hit them higher. They come back with snow on them. Sometimes even with a visa stamp from another planet. W. G. GRACE: I once hit a ball up in the air in a county game for Gloucestershire in 1877. It went to the skies and never came down. My runner and the non-striker ran for 3 days – a total of 1237 runs before one fainted and the other died. It is yet to come down. CHRIS GAYLE: Nah. I score quicker than you. W. G. GRACE: 1237 runs off 1 ball. That’s a strike rate of 123700. You score quicker? CHRIS GAYLE: I run faster. W. G. GRACE: I was a champion hurdler. Come one, tell me you are a champion sprinter and I’ll believe you. CHRIS GAYLE: Look maan, I have sued my board. I bet you didn’t do that. W. G. GRACE: I took money directly from the people who came to see me bat – I was an amateur still! CHRIS GAYLE: Huh? All right maan, tell me how I smash Mumbai. First, Malinga. W. G. GRACE: Like I said, bat with the bat held upside down. If you want the bat handle thicker, ask Kambli. He used 9 grips on the bat. Use it to deflect it to fine-leg and third-man. Complain to the umpire that you are losing the ball in the ehite streaks of his hair and have him dye his hair pink or fluorescent. He’ll get distracted and will retire hurt with feelings. It would be something to see a bowler retire “hurt”! CHRIS GAYLE: Splendid maan. Haa-bha-jaan? W. G. GRACE: Tell him that you are writing a book and that you saw Tendulkar fret at the thought of seeing you bowl to him. He’ll call for a press conference and might call you names. Then he’ll chuck full tosses at you. You can smash them and apologize to Tendulkar and the media later. That way you win the match and also get to keep your IPL contract. CHRIS GAYLE: And finally, Franklin? W. G. GRACE: Ensure you give him the greatest respect in the first couple of overs. Then Haa-bha-jaan is bound to give him the 19th over. Then he’ll bowl length and ensure you smash him this time to Auckland straight. CHRIS GAYLE: Thanks maan. See ya after the win tonight. Care for a drink? W. G. Grace (@WGGrace2) interviewed Shoaib Akhtar on the launch of his book, Controversially Yours. As two massive egos battle in a clash of words, all hell broke loose. W. G. Grace: Shoaib, congratulations on your book. S Akhtar: Thanks. People told me you are great. I bet I would have scared you too if you played in my time! W. G. Grace: We’ll get to that. To start with, the obvious question, was Tendulkar scared of you? S Akhtar: The whole of India was scared of me. I was big. I was quick. I was nasty. No wonder he was scared. W. G. Grace: The others weren’t scared? S Akhtar: Every one was. Every player past and present. Even my captains and countrymen were scared of me. W. G. Grace: Past and present? Do you know there was a time when wickets were a foot high and two feet wide. Akhtar's autobiography has stirred up quite a storm already. S Akhtar: That’s why I am the best. Ambrose, Mc Grath would have been useless with the bounce. I would bowl yorkers and still bowl them! W. G. Grace: There were bowlers before them too. S Akhtar: I know dead man. I’m the best bowler there was. Since the beginning of the game in 1870s. W. G. Grace: In 1727, the game was still being played. There were good bowlers back then too. The pitch was of 23 yards. S Akhtar: Well, I would have bowled quick still. I would have bounced a lot of people. W. G. Grace: They bowled under-arm. S Akhtar: I would have bounced them bowling under arm as well. W. G. Grace: There were no LBWs. S Akhtar: That’s why I would hit them on the head, old man. W. G. Grace: Owners could contest unmpires’ decisions. S Akhtar: Thank goodness, there was no Shah Rukh Khan back then. He was a cheat, you know? W. G. Grace: Cheating was allowed back then. S Akhtar: Nice. So I didn’t have to say I had hyper extension of my elbow. W. G. Grace: You would have found a way past the handkerchief law? S Akhtar: He was Stuart Law’s ancestor? S Akhtar: Well the law maker back then must have been scared of me too. I can’t make any sense of what he says. W. G. Grace: None of us can make sense of what you say. Where did you get that accent? S Akhtar: Rawalpindi. In its ‘Speak Englees Eeji’ tutorial. W. G. Grace: How would you have bowled to the great batsmen of the under-arm bowling days? S Akhtar: I would have yorked them at high speed with a massive run up. W. G. Grace: High speed bowling under-arm? S Akhtar: I would have swung it late. W. G. Grace: Before the 16 century, they played with wooden balls. No seam, no leather, no shiny side and no lifting of the seam. S Akhtar: Oh! I would have knocked their stumps over. W. G. Grace: They didn’t have wickets like today. The stump was the stump of a tree. S Akhtar: I would have uprooted the tree then. W. G. Grace: With an axe? S Akhtar: With the wooden ball. W. G. Grace: This is before that time – in the 15th century where there were no standard wooden balls. Anything wooden and round, any size would do. S Akhtar: I would have hit them with rocks. W. G. Grace: I said wood. Before this, it was a French game, from where wicket originated, after a small gate. Bail originated from beil. The game was called Creag. in 1300 that evolved into criquet and later into creckette and then crickett before becoming cricket. S Akhtar: I don’t care what it was called back then. All I know is, they were scared of me back then too. W. G. Grace: You wouldn’t be born for another 700 years when they were playing. Why would they be scared of you? S Akhtar: I meant my countrymen. I’m sure they were scared. W. G. Grace: Your country wouldn’t be born for another 650 years. S Akhtar: I meant someone from my region. W. G. Grace: There would be no trace of cricket in your country for another 500 years. S Akhtar: This is racism. We were denied a fair chance. You English denied us even back then. W. G. Grace: English? We are talking about French now. Cricket wouldn’t hit the English shores for another 150 years. We’re in 13th century France now. S Akhtar: Get those batsmen on twitter and let me flex my torso. I bet they’ll be scared. W. G. Grace: You still have the skin infection there? W. G. Grace: Yes, you are right. All of us, past, present and future are scared of you. It is learnt from close sources of the Indian management who are in constant touch with W. G. Grace through the social analytics product Say Grace that the doctor is against technology in cricket and his liking for Indian food. Here’s the transcript of the conversation between the doctor and BCCI’s Rajiv Shukla. Rajiv Shukla: Good morning, doctor. I have a favour to ask of you. W. G. Grace: No fat boy. You can’t have my bread and jam. There’s hardly any bread and jam available in this cyber cocoon. Why don’t you send me some in an e-mail attachment? Rajiv Shukla: No, doctor. Am not in need of your food. I need your advice on technology. W. G. Grace: Technology? I hear London has cabs with horses pulling carts to King’s Cross in quick time. So what? Rajiv Shukla: I meant DRS, Hawk Eye, Hot Spot and D/L methods. W. G. Grace: What the hell are these? If anything, I have a soft spot for my patient Rosie. Rajiv Shukla: Ye kya bakwaas software hai yaar? Someone fix this quickly please. The conversation resumes after a successful upgrade to Say Grace. Rajiv Shukla: Doctor, your take on technology please? W. G. Grace: Yeh sab bakwaas hai. Go back to umpires. Rajiv Shukla: Doctor…. aap aur Hindi? Kaise? 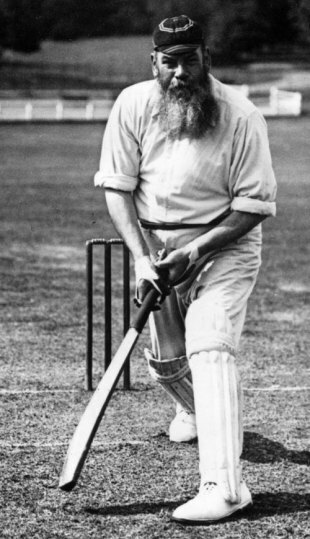 W. G. Grace: Bollywood mere dost. Rajiv Shukla: Can I quote you on the technology, doctor? I see that your MCC friends might take it badly. W. G. Grace: Also tell them that I now like vada pav. Rajiv Shukla: Isn’t sliced bread the greatest invention of mankind? W. G. Grace: No. Tendulkar is. And what he likes eating must be the greatest invention. W. G. Grace: Fat boy, make sure you quote me on this. Else, Pawar saab won’t pay me. Rajiv Shukla: Kamaal hai yaar. Money influences a software’s reasoning too! Achcha, doctor, how about D/L method? Your take? W. G. Grace: Send them to IIT Madras. Ask them to taste idly and vada and learn mathematics from Ms. Maya, an alumni, and wife of ACP Anbuchelvan. Rajiv Shukla: Lagta hai, N Srinivasan ka kaam hai. Ab saala Tamil bhi bolne laga. Doctor, your final verdict on D/L method? You think it is fair? W. G. Grace: Idly with sambaar and gatti chutney is fair. D/L method is nonsense. Tell the MCC folks to find a solution for shortened games in idly, sambaar, gatti chutney and vengaaya chutney. I’m sure the answer is somewhere there. Rajiv Shulka: Doctor, what do you suggest I tell the press? I’m confused. W. G. Grace: Tell them that you are on a diet in an effort to improve the image of Indian cricket. Slim down fat boy! Rajiv Shukla? No. Never heard of him. The family historians in England have confirmed that the twitter handle indeed captures the essence of the doctor as they have known and have given their thumbs-up. It is learnt that senior Indian batsmen have been queuing up and are talking to the product the Indian board has decided to call Say Grace. What do I think of DRS? The giant screen in the ground is put in place to show me bat and not to contemplate whether I was out or not. The CouchExpert is licensed under a Creative Commons Attribution-NonCommercial-NoDerivs 2.5 India License.